Confidence is a critical factor in achieving success in life. If you approach a task saying to yourself, “I’ve got this”, you are much more apt to accomplish that task. Lately, I’ve been struggling with my chipping from just off the green, saying to myself, “Uh oh, I’m in trouble” when confronted with these shots. Consequently, I tighten up mentally which translates to tightening physically. I’ve been on the edge of the dreaded chip yips. My solution? As usual, I endeavored, like Hogan, to “dig it out of the dirt.” I found a chipping practice area and experimented with different techniques, looking for the most reliable one that would hold up under the pressures of one-shot-only golf. So I thought back to my youth when good chipping got me into the 70s often, and reconstructed and remembered what I did then. The first memory had to do with club choice, and the 7-iron came to mind immediately. The chip and run. Much safer than a wedge, the 7-iron, with its less loft, reduces the margin for error, as it gets the ball on the ground quicker, requiring a much shorter backswing, and increases your chances of making clean contact with the ball first. OK, next memories, ball position and alignment. I opened my stance, with my shoulders a bit left of target, and placed the ball off my right toe. I then picked a spot to land the ball, figuring on about a third flight and two-third roll out to the cup. This of course will vary with the amount of fringe you have to go over before the ball reaches the green’s surface, and the length of grass you’re going over. The moisture on that fringe also plays into the calculations. In the spring when the ground is wetter, you want to hit it closer to the green to account for the moisture slowing the ball’s movement. Tricky, but not impossible to negotiate. I still think it’s easier for an amateur to use a 7-iron in that situation than a wedge. Leave the wedges for the pros to figure out. Even if you miss hit the 7, you still have a better chance of putting your next shot than dubbing it and hitting another chip. Now I’ve experimented with different backswings for this shot and what I’ve settled upon is a kind of half arm, half wrist move, which helps me retain the feel needed for this shot. I’ve tried all arm, no wrist and I get too tight mentally and physically to maintain a good smooth action. The problem, though, with bringing more wrist into the shot is you can get too flippy and hit behind the ball. So at impact, you need to make sure the hands are leading the club head, which helps insure the club head strikes the ball first. Yes, this is similar to Phil’s hinge and hold method, but he’s mainly referring to using a wedge. Again, leave the wedges to the pros. They have the time and motivation to hit 300 practice shots every day to perfect their technique. The length of the backswing depends on the length of the shot and how much fringe you need to traverse. I would still stick with the 7 as any higher loft brings into play the possibility of more possible error. This is golf on the ground as they often play on links courses. And if the grass is cut very close off the green, a putter–the old reliable Texas wedge–can be the club of choice, and perhaps the one of least possible error. Getting the speed right is perhaps the toughest part of this shot, and the one I’ve struggled with the most. My tendency is to be too strong and go too far beyond the hole. The speed of the green is a major factor here, as is the lie, and how much break you’re reading. You’ll need to experiment, but what I’ve found is that hitting that 7 on the sweet spot does not require much of a backswing. A solidly hit 7-iron chip will leap off the clubface so figure on less carry and more roll in your calculations, especially when you’re chipping directly onto the green with no fringe to consider. Keep the head steady throughout, the weight mostly on the forward leg, the left arm pretty straight, the shoulders level on level ground or following the contours of the ground on hilly lies, the eyes on the front the golf ball to help insure hitting the ball first, one or two simple swing thoughts in mind, like “hands before club head”, and the follow through relatively short. Confidence grows with the number of tap-in pars you can make with the successful application of this shot, since pars are the gold standard for mid or high handicap amateurs. If you can put your approach shot near the green, you walk to your shot knowing you have a good chance of chipping up and down for a par. Of course you’ll want to practice those approach shots, trying to get them on the green’s surface, but this chip and run increases your chances of parring the hole, thus increasing your level of confidence. 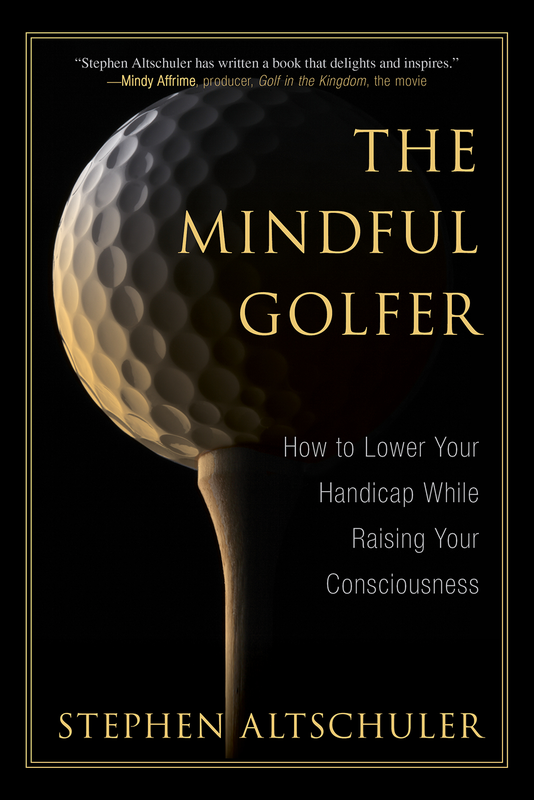 Amazon now has a sweet discount on my book, The Mindful Golfer. Check it out. Thanks Stephen for the good tips. This shot is my bugaboo too. Since I don’t practice much a reliable go to shot is a must! Glad you find it helpful, Richard. It really is a reliable go-to shot, especially for folks, like you and I, who don’t have much time to practice. Since chipping has been my consistent nemesis until recently, I thought I would share my recent “successful” effort which seems to have helped. I’ve moved to a “hinge and hold” with some modicum of success but the key swing thought for me is to “graze” the grass on the follow through. This prevents chunking as I just slide the club head across the top of the grass. This helps me not to break my wrists and to keep the club low to the ground directed at the target rather than to the left or right. My feel is better and I’m able to sort out distances better than in the past. This probably won’t help anyone else but it’s helped me. Cheers. I’ll have to try that follow through, David. I can see why it would work. I especially like that chunk-prevention function.